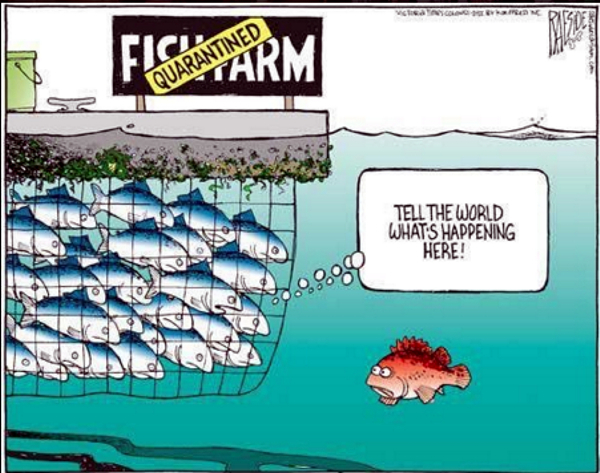 Did you know that farmed salmon has been proven to be five times more toxic than any other food tested? Farmed salmon should even be one of the most toxic foods in the world and not just a disaster for the environment, but also for human health! Salmon farms are generally considered a major environmental problem. Due to the high fish density, parasites such as salmon lice can multiply rapidly. With its antennae, the lice attaches to the salmon and feeds on skin, blood and body mucus. The pesticide Paramove 50, which stuns sea lice, is used instead of antibiotic insecticides in feeds because sea lice become resistant to antibiotics worldwide. Not only is the chemistry used in factory farming underwater a problem, but another problem facing salmon farms is the enormous feed requirement of predator fish: While some farmed fish are able to live on a diet of corn or soybeans, others need fish to survive – and plenty of them: two to five kilograms of fish must be fed to produce one kilogram of salmon. In turn, this fish food is still traditionally caught in the sea. Feeding the fish with pork and chicken excrement is much cheaper than one with standard fish food. Fatal Result: Aquaculture contributes to the overfishing of the oceans.